The artistic duo, Havel Ruck Projects, made up of local artists, Dan Havel and Dean Ruck, have transformed a previously abandoned house into an interactive temporary public sculpture. Sourced from Cherry House Moving Company, the 1940s-era house was originally located in Santa Fe, Texas. After moving the home to Sam Houston Park in April, Havel and Ruck stripped the structure’s interior and exterior using drill saws and other tools. They cut circular holes into the walls and filled them with PVC pipe to create a “Swiss cheese” or “lace” appearance, and collaged the interior walls with vintage images sourced from family, friends and local resale shops representing the city’s people, places and past. 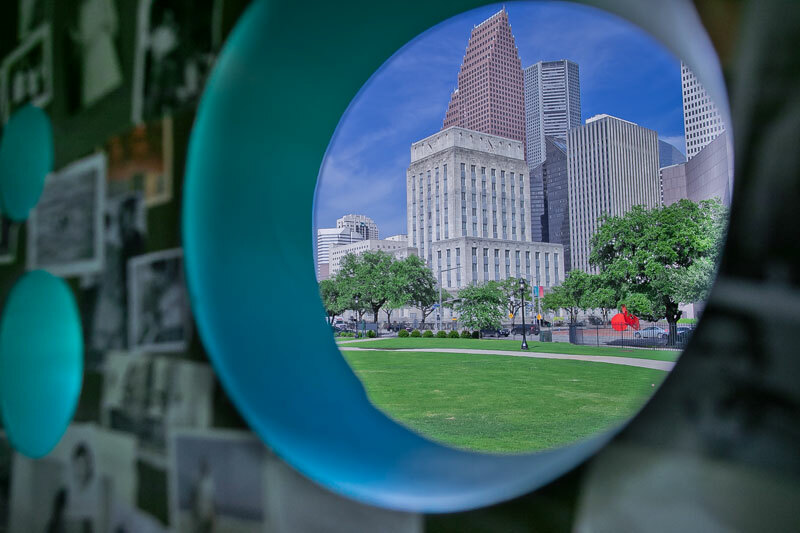 Visitors can walk through Open House, viewing both the modern skyscrapers of Downtown Houston and the landscape of Sam Houston Park through the holes that have been carved out of the house. At night, the house will be lit from within, creating a lantern effect. It’s a fitting addition to Sam Houston Park and The Heritage Society, which showcase other historic homes. Open House is open daily from dawn until dusk through February 2019.